The Anaheim Ducks organization and their fan base received perhaps the best news of their off season two days ago. 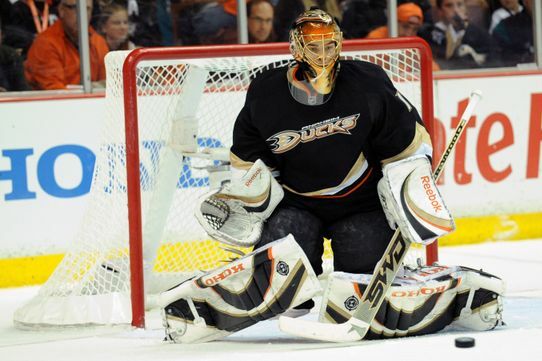 No it was not Teemu Selanne announcing he would return for another season in the O.C., rather it was Jonas Hiller declaring himself healthy and ready to go for next season. 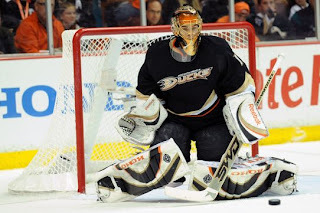 A serious case of vertigo sidelined Hiller for the final two months of the 2010-2011 regular season and forced the Ducks goaltender to watch his team, which went into the playoffs as the number four seed, lose in the second round of the playoffs, from the press box. Over the duration of Hiller's vertigo ridden last few months, doctors could not diagnose why he was stricken with the case of vertigo. However, in recent weeks Hiller has been able to train both on and off the ice, in his home country of Switzerland, with out any symptoms. Hiller was an All-Star last season and on his way to breaking the 30 win mark for a second straight season before he was sidelined and finished the season with 26 wins and a .924 save percentage. If Hiller returns to the Ducks and produces a season like he had going in '10-'11 the Ducks' chances at making a run at the Cup will shoot through the roof. If Hiller was present in the Ducks' line-up during the playoffs, and the Ducks did not have to rely on Ray Emery and Dan Ellis, they may have been able to outlast the Predators. With Hiller's return the Ducks will house one of the top goaltenders in the league, along with an offense lead by Ryan Getzlaf, Bobby Ryan, and reigning league MVP Corry Perry. The Ducks also have one of the toughest defensive units lead by young star Cam Fowler, and constant offensive threat, Lubomir Visnovski. That seems like a mix that any team would like to have. Now if Selanne returns, the Ducks will be in great shape going into next season. Which would be ideal, being they are in the ultra competitive Pacific Division, which seems to have only gotten tougher during this year's free agency.